I've tried a handful of collagen supplements in the past and I have favorites that really delivers in making my skin moist, supple, and glowing. I'm happy that collagen supplements are now available in different forms- powder and juice drink, tablet, gummy, and candy to name a few. But I have this love-hate relationship with collagen because it adds a visible weight to my round face shape. 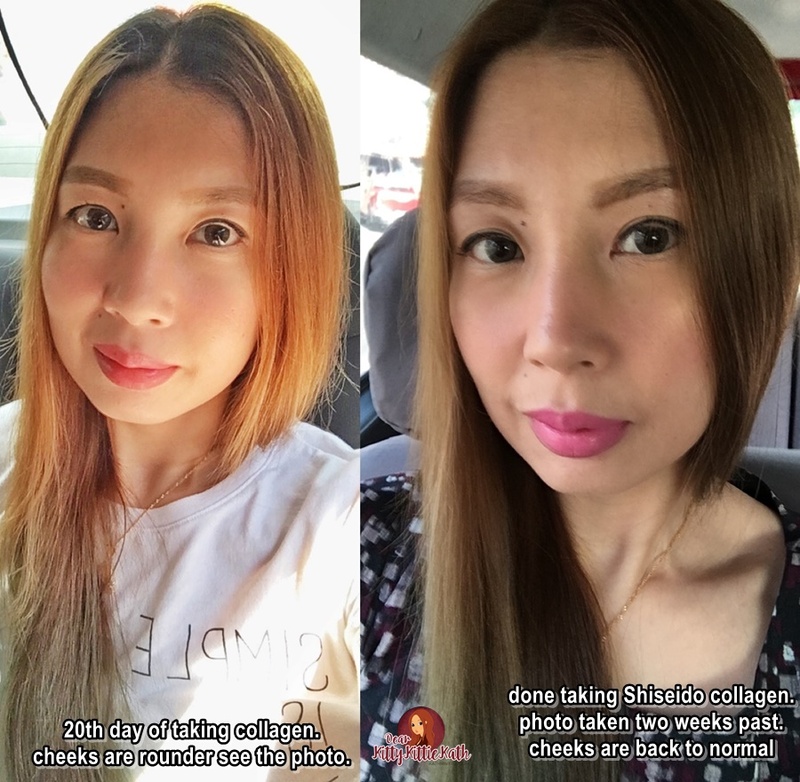 For women who have slim facial features, you're lucky because most of the collagen supplements are designed to plump the skin making your face look less haggard. It gives an extra lift to sagging cheeks. There's one brand that I love because I saw the effects as early as 1 week, but I hate because like with other brands, it gives me a double chin and bigger face in photos- Shiseido The Collagen Tablet. Full review after the jump! The Collagen has 4 types to choose from tailoring from your lifestyle. It has a collagen drink, collagen powder, powder smoothie and this tablet that I'll be reviewing. Formulated with Shiseido’s patented ingredients for their beauty effect as the combination. Cowberry- A red Beauty Fruit with a strong life force growing in extremely cold Northern Europe and the Arctic Circle. Amla Fruit A yellow-green Beauty Fruit super fruit which has been used as a health food for a long time in India. instructions for use: Take 6 tablets of Shiseido The Collagen in 2 divided doses before meals (empty stomach). I take 3 in the morning and 3 at bedtime. ingredients: Hyaluronic Acid, Ornithine, Vitamin B2, Ceramide, Royale Jelly, Vitamin B6, Gaba, Vitamin C, Vitamin E, and Low Molecular Weight Fish Collagen. Shiseido The Collagen is round in shape and the color is white. It is odorless that's why taking it is a breeze. You don't need to prepare because you can take it instantly with a glass of water. I took it for 21 days straight. The photo you'll see below was taken days after finishing a bottle of this collagen tablet. Sad to say that I have a double chin on the photos and it emphasized more of my chubby cheeks. Shiseido The Collagen, in my opinion, is fairly priced given that it is a premium brand and a bottle cost less than 2,000. I love the packaging because it's in a clear glass bottle that is sturdy. It comes in a well-sealed box packaging too upon purchase. It also contains other ingredients like Vitamin B2, Vitamin B6, Vitamin C and E though in small amounts when combined can contribute to other health and skin benefits. My skin is supple and soft to touch right after a week of taking this supplement. There's a certain glow that made my skin shiny but not the oily type of shine. No weight gain but there's double chin after taking this for a month which is a plus for me. I had weight issues with some collagen brands that I've tried before. Best combined with other beauty supplements to achieve maximum results. No weight gain but there's a double chin after taking this for 21 days which is a no-no for me. I have a round face shape and it became rounder while taking this collagen. Will I purchase? No. I prefer collagen supplements that make the skin glow and gave a little plump on my face and cheeks. I give this a 4/5 rating. Shiseido is a high-end brand when it comes to beauty supplements and I still recommend this to all the anti-aging fanatics out there because you'll really get what you pay for. In terms of effectiveness, yes it's effective but not for me. Ang galing Ms. Kath kita agad ang effect wala pang 1month.. Yun nga lang medyo pricey. Ang ganda ng result s inyo Ms. kath.. collagen and whitening tablet okay lang same i take noh?